The benefits of beets are many when it comes to maintaining good health. You may prefer wearing gloves when cleaning them due to their vibrant red color, but this root vegetable offers many possibilities when meal planning. You can make soup, juices or salads and one interesting attribute they offer is that they are delicious both hot or cold depending on what you’re making. Either way you are welcoming the benefits of beets in every meal you serve that includes them. So what benefits does this beautiful red vegetable offer? Beet roots are one of the best foods you can eat to naturally detoxify the liver. That is because they are rich in vitamin A and phytonutrients which are also called betalains. One nice thing about this root vegetable is that you can use all of it, including their leafy tops. Though the leaves may be bitter they are rich in chlorophyll, vitamin A and provide powerful antioxidants. You can always use the leaves when making fresh vegetable juices. If you would like a delicious drink made from beets check out the recipe called “The Liver Rejuvenator” on the juicing recipes page, it is a great way to help improve liver function. Beets are also a welcomed food when dieting. We already know they are a healing food that provides a ton of nutrition but they are also filling and low in calories. 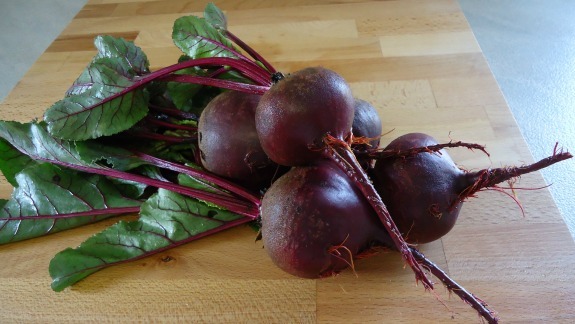 Two medium fresh raw beets (2 inches in diameter) contain about 70 calories. Who knew that the simple garden beet has so much to offer?